A back four that was missing arguably it’s entire first choice line-up (Lowton, Vlaar, Okore and Luna), Benteke laid low with, as one fan put it, Adebayoritis, a midfield unable to pass to each other and yet another inept performance, but this time Villa’s struggles weren’t covered over with the gloss of wonder goals or good luck. Even if it wasn’t for referee Mike Dean’s woeful performance, the best Villa could have got was a draw. In short, Villa got what they deserved with the 2-0 defeat. 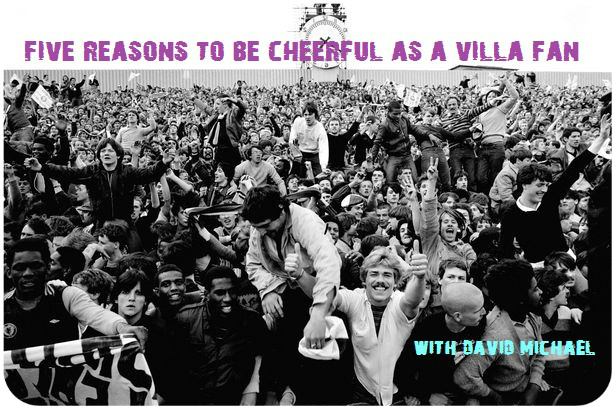 So what is there to be cheerful about as a Villa fan? 1. Well, the only real Villa-related highlight happened on Saturday when Jack Grealish scored his first professional goal while on loan to Notts County. What a beauty too. Later he took to tweeter to dedicated the goal to his late baby brother. 2. The FA Cup draw served up a reasonably okay tie against Sheffield United at home. Although, you just don’t know with Villa. Capable of beating anyone, but due to the lack of prowess in possession and possessing a lightweight midfield, they can be beaten by anyone. There’s not that much difference in personal from the team that got beat by Bradford City. Lets hope we can power on through. 3. Nicklas Helenius is apparently still alive. Seen on the Villa bench against Fulham, we were wondering if he was still with us. Speaking of Danes, a funny story Paul Faulkner told MOMS a few weeks ago. A Danish TV company based a couple of reporters in Birmingham to cover the fortunes of Jores Okore and Nicklas Helenius when they both signed for Villa in the summer. Apart from a handful of games from Okore at the start of the season and Helenius having his shorts pulled down, they’ve pretty much been hanging around twiddling their fingers in Brum. I wonder if they’ve been called back yet? 4. There are no more games in the West of London left this season. It seems the only place we lose this season apart from Villa Park. 5. Lambert surely knows the performances haven’t been good enough recently. Surely? A five-game unbeaten run was hiding some harsh realities that needed addressing by the Villa manager. This Fulham defeat should make things crystal clear, we hope.